Jan Karski was a witness to one of the greatest tragedies in history: the extermination of the Jewish population of the Warsaw Ghetto. 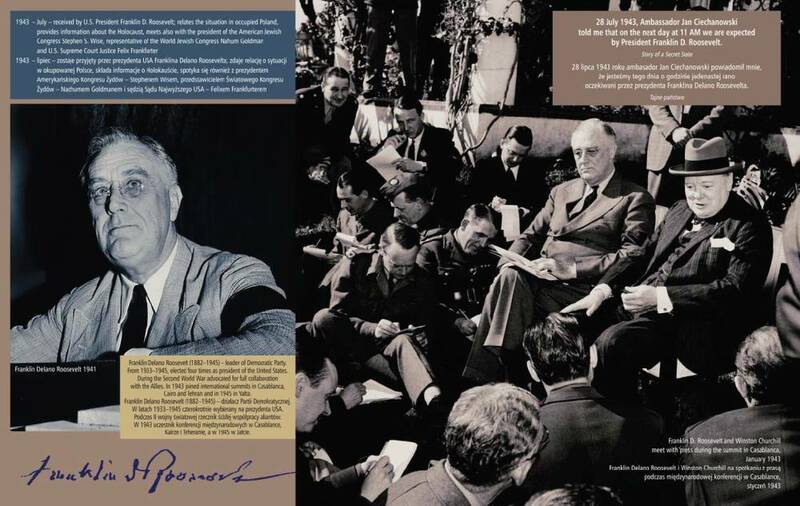 In spite of a meeting with Roosevelt and the publication of his 1944 book, Story of a Secret State, his efforts to warn Western leaders proved fruitless at the time. Little is known about him. He has often gone down in history as a "forgotten" hero, but 2014, the 100th anniversary of his birth, is an international occasion to preserve the memory of the tragic past as most remaining direct witnesses of the Holocaust are fading away. Following the outline of a Polish-English album entitled Jan Karski Photobiography (by Maciej Sadowski), Culture.pl follows in his footsteps. We relive the war through the eyes of a witness to one of the greatest tragedies in history. Mother fanatically admired Piłsudski , so that at home there reigned an atmosphere of admiration for Piłsudski . She never spoke of him as Marshal Piłsudski , only as Father of the Nation. I wanted to join the diplomatic service, because I wanted to represent my nation. I was a proud citizen of a big empire - Poland. I believed in the power of Poland - military, economical, in any terms. Those weeks, I realized, had been largely spent in meeting shock after shock [...]. The world I lived in was falling apart around me. I felt like a shipwrecked man in the ocean, who, after being hit by a wave, can do nothing but wait for the onslaught of the next one. To the point of exhaustion. There was no longer a Poland. And with it had disappeared the whole mode of existence that had previously been mine. After the Ribbentrop-Molotov Pact, Poland was divided between Germany and the USSR. Karski was arrested by Soviet forces entering Poland, put in a camp for Polish war prisoners and sent to Kielce as part of the Soviet-German prisoner exchange, where he managed to escape to Warsaw. There, in the skeleton of a city once sprawling with theaters and cafés, he started his involvement with underground activities through his brother. 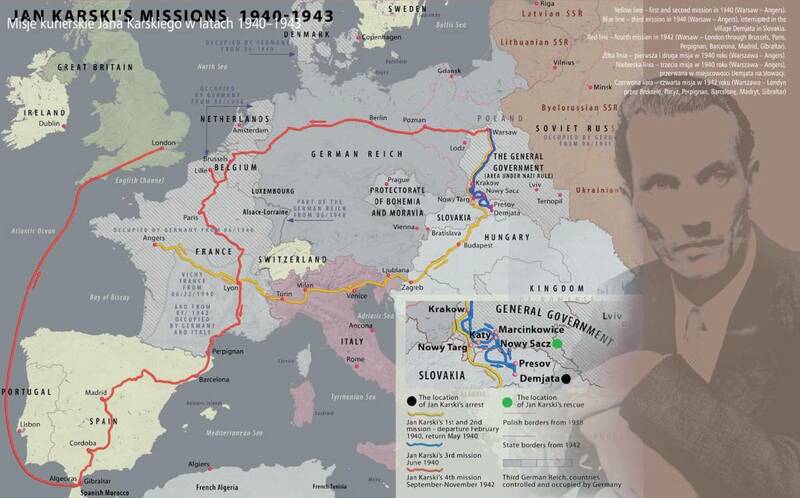 In January 1940 Karski went on his first secret courier mission to the Polish government in exile in Angers in France. During his next mission he was arrested by the Gestapo in Slovakia and imprisoned. Tortured for concealing information during the investigation and fearing that he would break, he attempted suicide. He was revived and taken to a hospital. With the help of of hospital staff he escaped. Before midnight, while fluffing my pillows and taking my temperature, Slowikowski whispered that around midnight he would open the door and light a cigarette. -Then you have to strip off these rags and as you were created by God, naked, walk into the corridor after me. First window on the right will be open. Jump. And he left. It was now the beginning of October 1942. 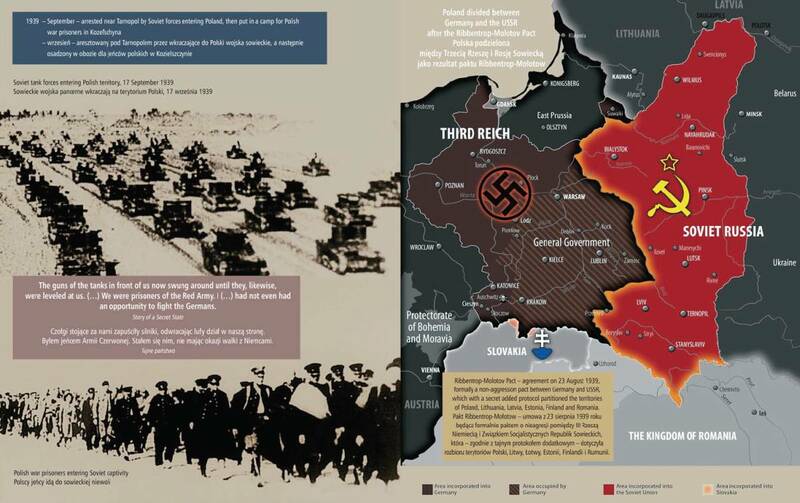 In two and a half months, in one district in Poland, the Nazis committed three hundred thousand murders. It was [...] the report [...] I had to bring to the outside world. 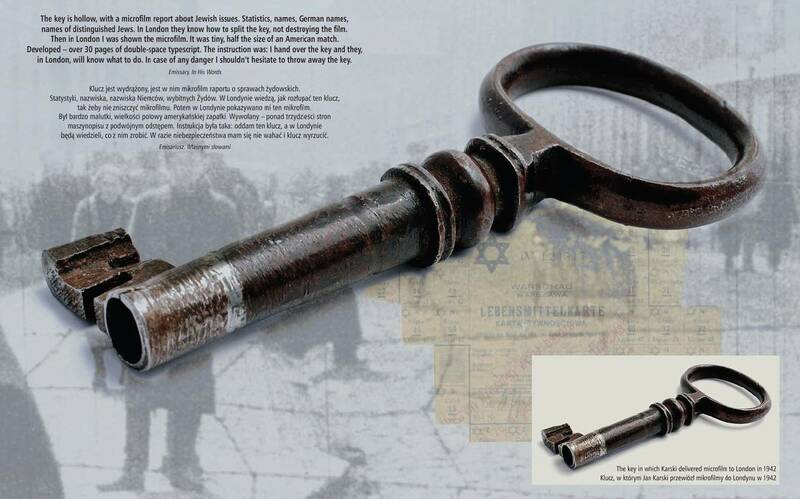 The key is hollow, with a microfilm report about Jewish issues. Statistics, names, German names, names of distinguished Jews. I will remember that day till I die. [...] I wonder now how many people can understand what it means to die as he did. [...] Of all the deaths that have taken place in this war, surely Zygielbojm's is one of the most frightening. Karski is finally received by President Roosevelt in July 1943 whom, as a first hand witness, he informs about the Holocaust. His reports are met with disbelief and provoke no reaction. After a failed attempt at making a film about the Polish Underground Karski decided to write a book about his missions. 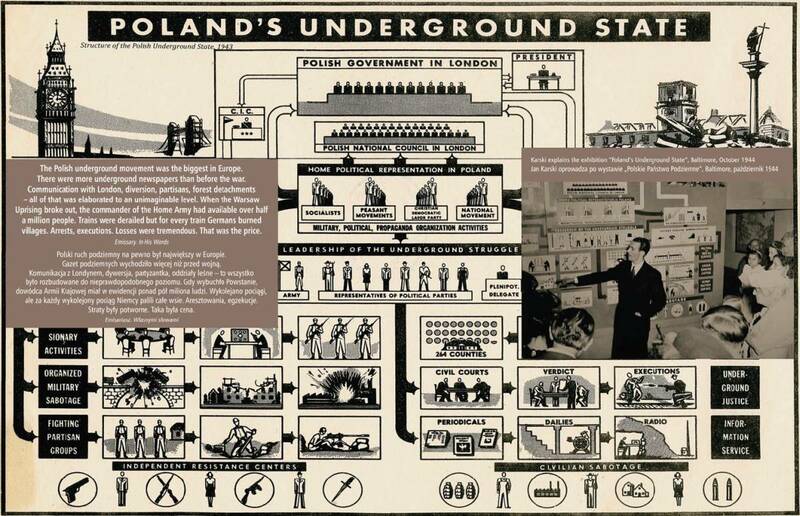 The Story of a Secret State came out in 1945 and became an overnight bestseller. Published by Houghton Mifflin, it sold 400,000 copies and was quickly translated into other languages. This period remains the least known time of Karski's life. He wrote a PhD at Georgetown University and went on a four month lecture tour sponsored by the U.S. Information Agency. In 1965 he married for the second time. After 30 years of silence, in an interview with Claude Lanzmann in 1978, he talked about what he saw in the Warsaw ghetto and the Izbica camp. The interview became part of Lanzmann's film Shoah. 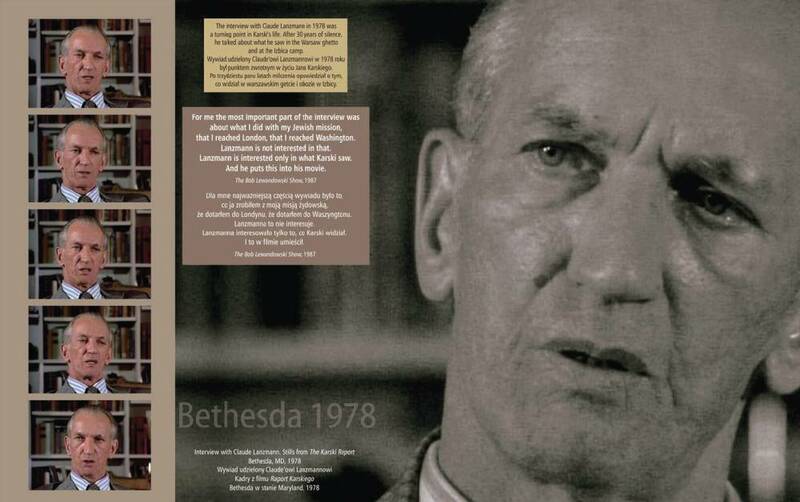 Karski was deeply religious, in his famous speech at the United States Holocaust Memorial Council in 1981 he said, "God gave me the task of speaking and writing during the war, when - like I thought - it would change something. But that didn't happen". At the end of the war I learned that governments, leaders, scientists and writers didn't know about the fate of the Jews. They were surprised. The Holocaust of six million innocents remained a mystery. [...] I am a practicing Catholic. Although I am not a heretic, my faith still tells me the second original sin has been committed by humanity [...] This sin will pursue me till the end of times. [...] And I want it to be that way. Karski firmly believed that no nation or government ought to appropriate the "holy and cursed term" Holocaust. "Holocaust belongs to the Jews", he said, "The tragedy of the Jews is incomparable, there was nothing like it in the history of humanity." Then I became a Jew. Like the family of my wife - all of them perished in the ghettos, in the concentration camps, in the gas chambers - so all murdered Jews became my family. 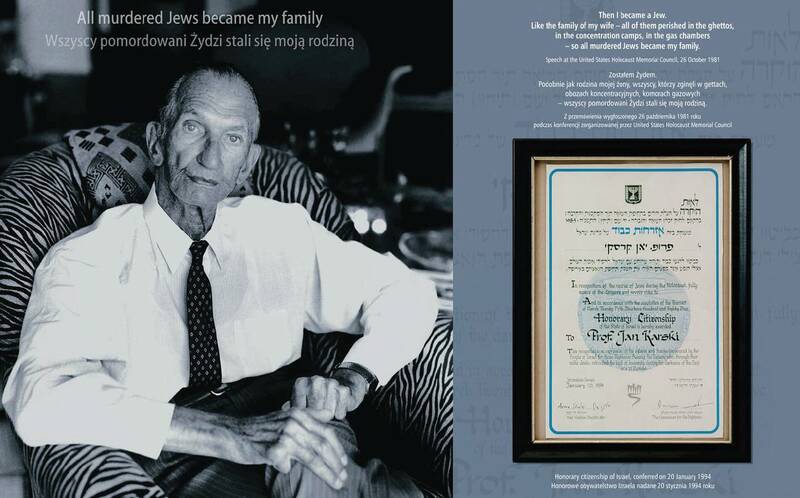 Karski became an honorary citizen of Israel in 1994. He died on the 13th of July 2000. On the 29th of May 2012 President Barack Obama posthumously decorated Karski with the Medal of Freedom. Over the past few months, Karski has attracted a significant amount of attention, starting from the permanent Google Cultural Institute archival exhibition launched in autumn 2012, several book publications, two exhibitions about Karski at the United Nations in New York City and a French theatre production, Jan Karski: My Name Is a Fiction by Arthur Nauczyciel and based on Yannick Haenel's novel. 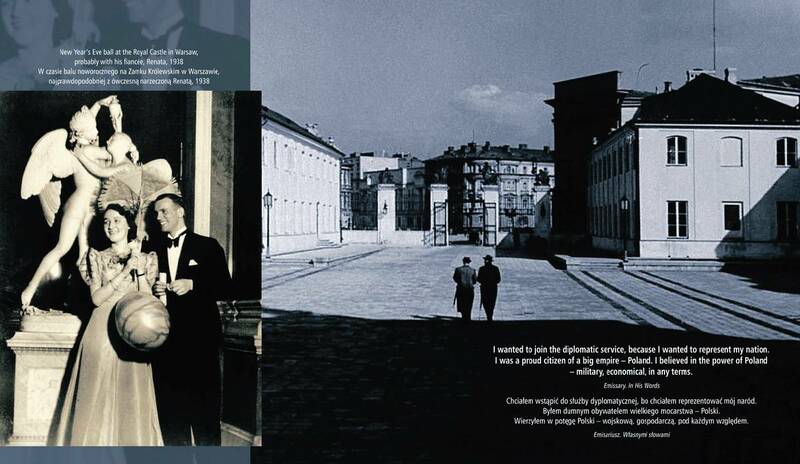 All visual materials and quotes are from Maciej Sadowski' s album Jan Karski. 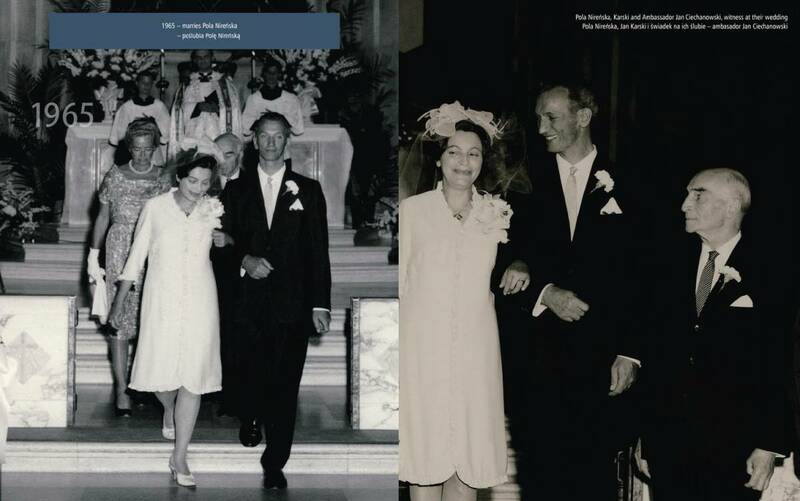 Fotobiografia / Jan Karski. Photobiography. 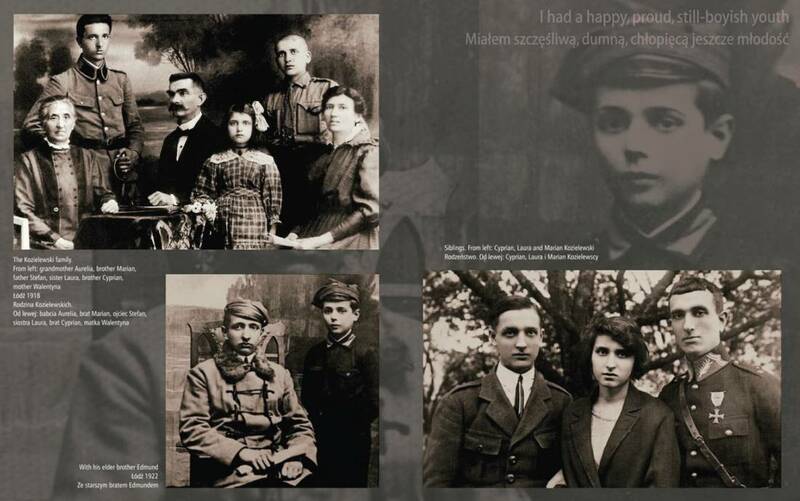 Sadowski's Photobiography format offers an overview of the lives of Ryszard Kapuściński, Maria Sklodowska-Curie and Janusz Korczak.